Below, an overview is given of all possible research projects within the theoretical / computation chemistry subgroup. For each project, an indication is given whether this project is feasible for a Bachelor Final Project, a Capita Selecta or a Master Final Project. Turing patterns are used to describe the formation of spots and stripes in nature. 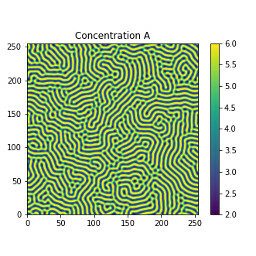 In this project, you will explore which conditions are required to observe Turing patterns in reaction-diffusion systems. Building upon this knowledge, we will construct Turing patterns in three-dimensional space or explore which patterns can be found by increasing the number of reactants in the system. Multiscale reactor modelling based on microkinetics and machine learning. Contemporary reactor modeling uses relatively simple chemokinetic rate expressions. 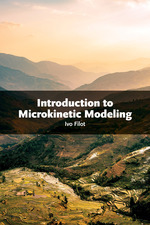 As a step forward, a hierarchical reactor model is constructed wherein the fundamental kinetics are based on highly accurate microkinetic simulations. 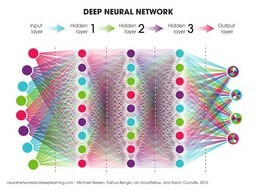 Since the direct evaluation of microkinetics is too cost-intensive for more advanced reactor models, an artificial neural network is built that captures all reaction kinetics. This ANN then acts as the kinetic model in the overall reactor simulation, significantly reducing the computational cost making such simulations computationally feasible. Unraveling support effects on the cobalt-based Fischer-Tropsch Synthesis. It is well known in literature that for many metal-catalyzed reactions the support influences the catalytic properties of the metal particles. The interaction of the support with the metal determines the size and shape of the catalytic nanoparticles, which in turn determines their activity and selectivity. Despite many studies in which these effects have been shown, the exact mechanism wherein metal-support interactions at the nanoscale propagate towards the meso- and macroscale remains unknown. In this project, a reactive force field is constructed that models the metal-metal, metal-support and support-support interactions to study the influence of the support on the overall catalytic activity and selectivity. As a model system, we will focus on Co-based Fischer-Tropsch Synthesis. Elucidating the reaction mechanism of cobalt-based Fischer-Tropsch Synthesis. In Fischer-Tropsch synthesis (FTS), it is observed that the activity and selectivity towards longer hydrocarbons increases as a function of particle size until the particle diameter is about 6 nm, at which further increase of the particle diameter does not result in a significant change in activity and selectivity. Herein, it is hypothesized that the nanoparticles have to be sufficiently large in order to harbor an adequately high abundance of so-called B5 sites, which are attributed as the locus for CO dissociation and C-C coupling. Besides B5 sites, there exist more candidate active sites that are expected to have a similar high activity in FTS. In this project, you will explore the activity and selectivity of one of these candidate active sites by construction of a detailed microkinetic model wherein the kinetic parameters are derived from advanced density functional theory calculations. 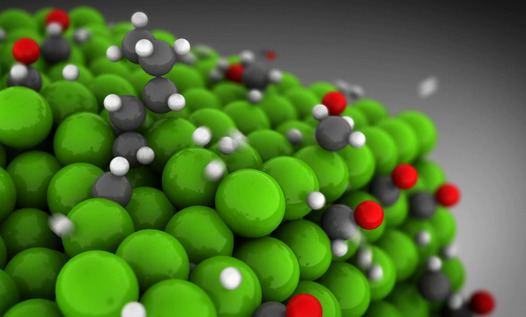 Molecular catalysis has revealed that the macroscopic phenomena observed in experiments are caused by the emergent behavior of very small particles guided by the laws of quantum mechanics. Remarkably, these quantum effects are propagated over roughly ten orders of magnitude, at which point their behavior is considered to be classic. Within this work, we will elaborate on the connection between the smallest quantum scale and the larger macroscopic scale, providing a theoretical framework on which many kinetic studies in heterogeneous catalysis are based. We will focus on the underlying quantum chemical mechanism leading to the observed overall rate laws in chemistry and process engineering. 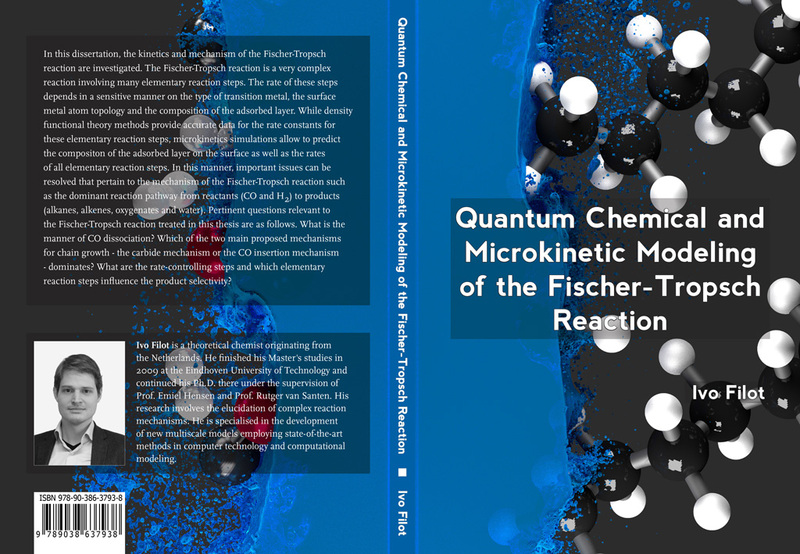 In this dissertation, the kinetics and mechanism of the Fischer-Tropsch reaction are investigated. The Fischer-Tropsch reaction is a very complex reaction involving many elementary reaction steps. The rate of these steps depends in a sensitive manner on the type of transition metal, the surface metal atom topology and the composition of the adsorbed layer. While density functional theory methods provide accurate data for the rate constants for these elementary reaction steps, microkinetics simulations allow to predict the compositon of the adsorbed layer on the surface as well as the rates of all elementary reaction steps. In this manner, important issues can be resolved that pertain to the mechanism of the ­Fischer-Tropsch reaction such as the dominant reaction pathway from reactants (CO and H2) to products (alkanes, alkenes, oxygenates and water). Pertinent questions relevant to the Fischer-Tropsch reaction treated in this thesis are as follows. What is the manner of CO dissociation? Which of the two main proposed mechanisms for chain growth - the carbide mechanism or the CO insertion mechanism - dominates? What are the rate-controlling steps and which elementary reaction steps influence the product selectivity?